Use spotlights. Dramatic lighting is one of the keys to any truly successful theatre production, and nothing provides the same kind of dynamic visual impact as a spotlight suddenly hitting the stage. Save power and $ by using LED lighting. 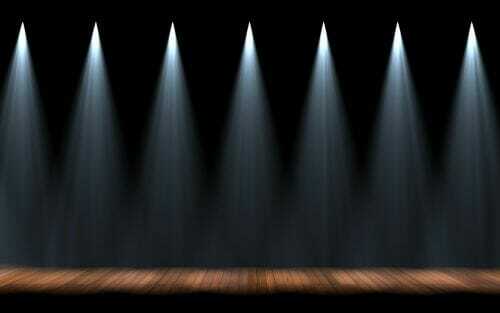 LED stage lighting offers a long-lasting, low power, and low heat alternative to conventional stage lighting. LED lighting is becoming increasingly popular for live music events and festivals, where they are more visible than conventional lighting is daylight. They are also more friendly to the environment by using a lot less power – also saving you money on your electricity bills. Due to low heat output, LED instruments can be used in areas where the high amount of heat conventional stage fixtures put off would not be ideal. For this reason, LED lighting is used to light ice sculptures, especially when lighting the sculptures from within. Use different colour lights. LED lights can contain number of different coloured LEDs, often red, green and blue, and many different colours can be achieved by adjusting the intensity of each LED color group.